American Lindsey Vonn has won a record 20th World Cup trophy after securing the downhill title in La Thuile, Italy. The 31-year-old finished in second place behind Italy's Nadia Fanchini, but extended her lead in the standings to 173 points ahead of Canada's Larisa Yurkiw of Canada. With just one race left worth 100 points, Vonn secures a record eighth downhill title. She has now surpassed Swedish great Ingemar Stenmark's 19 titles. However, Vonn's victory was overshadowed by a fall-out with one of her main sponsors, Head. A day earlier, Vonn posted a video of an angry outburst on Facebook in which she destroyed her bindings with a hammer following a race where one of her skis detached. 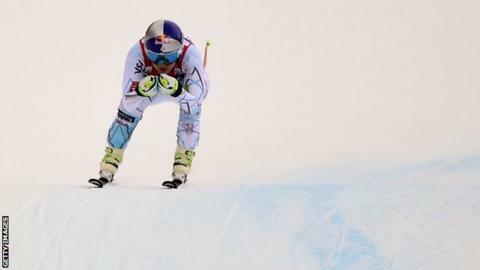 The former world and Olympic champion deleted the video and apologised for her outburst, saying it was "a huge mistake", but it has not gone down well with her ski supplier, where she has a 10-year contract. `It's a serious thing,'' Head women's racing director Christian Greber told The Associated Press. "For sure it will reach our [managers] and they will have a couple of discussions about several things."